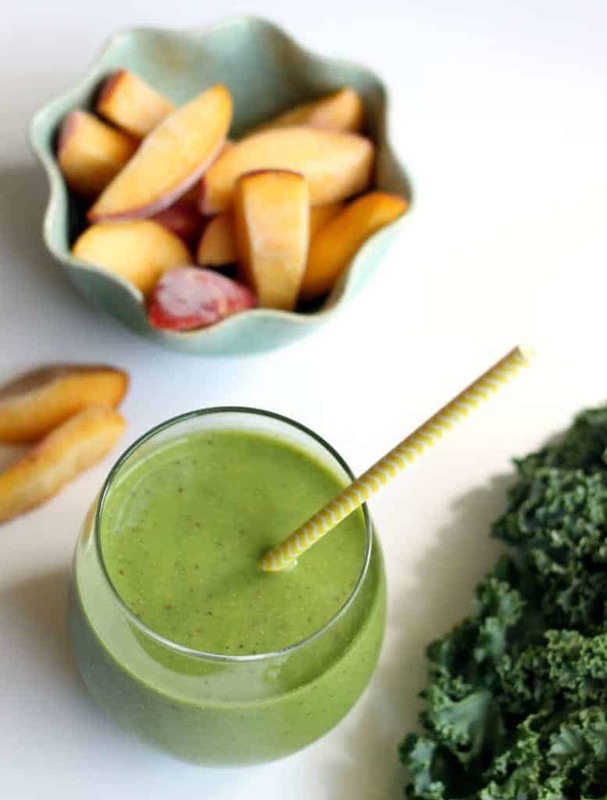 Adding juuuuust the right amount of kale to your morning smoothie is quite the slippery slope. Like you add one square inch too much and you’re DONE FOR. Say goodbye to the twenty dollars worth of localorganicvegan ingredients you just pulverized. You killed it with kale and now it tastes like wet dirt. You know how much I adore my blueberry chocolate green smoothie and it’s not like I want to be in a relationship with a different smoothie, but sometimes I want something less creamy and decadent and more refreshing in the a.m. This is kind of my official goodbye to summer smoothie, as sad as that sounds. It’s super simple and definitely less complicated than my normal smoothies, which have vanilla and dates and cacao and all kinds of annoying add-ins. Sure, this smoothie tastes like a tropical dream, but the real reason I’ve been obsessed with it is because it’s like drinking a salad. So basically I can eat a vegetable-less (does salsa count?) chickpea flour breakfast pizza for breakfast every gosh darn day and then chase it with this gorg glass of fruits and veggies and feel all kinds of great about it. I don’t like not starting my day with fruits and veggies. Or should I just say I like starting my day with fruits and veggies? When I’m running around and my meals turn into Amy’s burritos for lunch and eggs for dinner, I have to be able to count on my breakfast for sneaking in allllllll the fruit and veg. Whether you add a big leaf of kale or a huge handful of spinach, you’re getting a hot shot of pre-blended, easily digestible, super nutrient-dense raw veggies early in the morn. Raw is key. The majority of the veggies I eat are cooked (roasted broccoli, sweet potatoes, etc.) so I love knowing that I can slurp down three servings of raw fruits and veggies for breakfast without even thinking about. That, my friends, is precisely why smoothies rock my socks off. I make my smoothies in the Nutribullet. It’s by far my favorite kitchen appliance, followed closely by my big food processor. You really don’t need a Vitamix or Blendtec to make super smooth smoothies. Yes, I would give both of my thumbs and maybe my pinky for a Vitamix, but hashtag budget cuts, ya know? Now as far as the kale in this smoothie goes, I just get a big bunch of organic kale at the store and use one leaf per smoothie. It’s critical that you take the leaves off the stem, unless you want to drink a dirt smoothie. Up to you. If kale isn’t your jam, just throw in a huge handful of spinach. Hakuna matata. Or maybe even some swiss chard. Or dandelion greens. Or beet greens. Change it up, yo! For the fruit, I use the frozen pineapple chunks from Trader Joe’s. My mom had given me a few extra ripe peaches so I sliced and froze them for this smoothie. Feel free to buy good old frozen peach slices or just slice and freeze fresh ripe peaches in an even layer on a baking sheet and then throw them in a baggie once frozen. I also added my beloved hemp seeds for a bit of a protein punch, but if you don’t have them on hand, simply leave them out. Let’s chat for a hot minute about coconut water and why we love to love it. First of all, it tastes dreamy. Second of all, it’s naturally sweet, low in calories, and a fab source of potassium (more than a banana) and other electrolytes to help balance fluids in the body and regulate blood sugar. Think of it as nature’s Gatorade, sans all the artificial colors and flavors. You want to pick one that doesn’t have any added sugar. There should be one ingredient: coconut water. Boom shaka laka. Cheers to summer and all the bright green things. A super easy and delish tropical smoothie loaded with electrolytes and fiber! Gorgeous photos girl! I need to bite the bullet and add kale to my smoothies- the risk of adding an extra leaf is too much to bear ;)! This smoothie sounds like a dream! Have you ever added coconut milk to your smoothies- you will die (in a good way)! I love getting fruits and veggies in at breakfast too! It feels weird when I do not start the day with a smoothie! I love the addition of hemp seeds here. I have been loving pineapple lately. I have been eating so much of it as it is supposed to be a natural anti histamine! This is the best. 1 instruction. As long as the kale taste is masked- i’m game. Game game game. Right? One instruction recipes are da bomb diggity (your fave phrase). I love adding kale to smoothies! I always like to add in some greens to more morning breakfast smoothies. It’s a perfect way to sneak in some veggies! PEOPLE. I, too, was very hesitant about adding kale to a smoothie. VERY. I have heard bad things, so typically stick to spinach or power greens. However, this smoothie has me SOLD. You can’t taste the kale at all. I repeat, at allllllll. 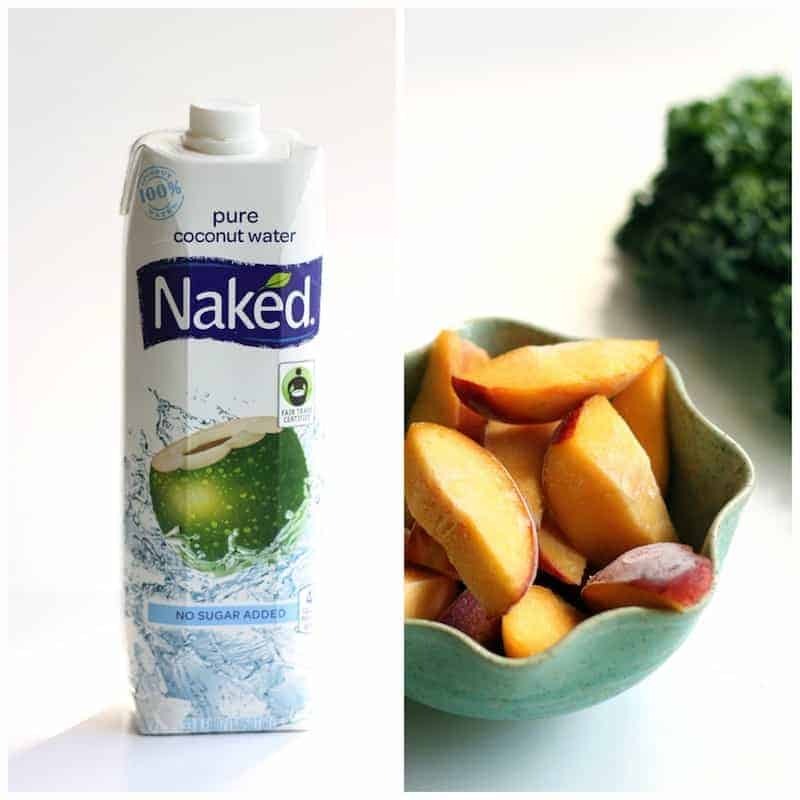 The fruity deliciousness of the peaches, pineapples & coconut water make it taste like a summery dream. This smoothie is amazing (a new fave) and it’s bright green so you feel super healthy and proud of yourself while you slurp it down and pretend you’re on a beach somewhere sun bathing. When really you are sweaty & gross and sitting on your couch watching So You Think You Can Dance. Or is that just me? Get down with your bad self and make this smoothie. I love it. Nicely done, Alexis! Another winner. Wahoooooo. You go girlllll!! I just added some frozen banana and it was da bomb. Try it! This was sooooooo good. Super creamy and fruity but not too sweet. Awesome breakfast! Awesome! I just made it again and added some frozen banana…fab addition! Coconut water saved me on saturday morning. We’ll discuss the events of friday night in detail this week…I have 800000 peaches in my house right now and I intend to eat all of them! Perfection. Wait. I need to hear about Friday night! The suspense is killin me. Right?! It’s the best start to the day! I have a ninja too and I love it but I’m with you on this! I have the pre-cut kale and have never had a problem with the “wet dirt” taste. I do however have a problem with not having chunks (small but present) of spinch/kale/whatever in the smoothies. They aren’t chewing size but it doesn’t look as creamy and pretty as the ones photographed here. Whenever I made a green smoothie in the ninja it always had green chunks! I only have the dirt taste if I add too much kale, but I’m glad you haven’t had that issue! Enjoy! The right amount of kale in the smoothie totally is a slippery slope! Once you find the perfect formula, it’s a eureka moment, but before that, it can be a real nose-plugger. I hit the wines a little too hard last night and am thinking I need to revive my everything with this smoothie. You would know Miss Kale Queen!!! I just totally loled at your wine comment. This is my kind of recipe – only one step! 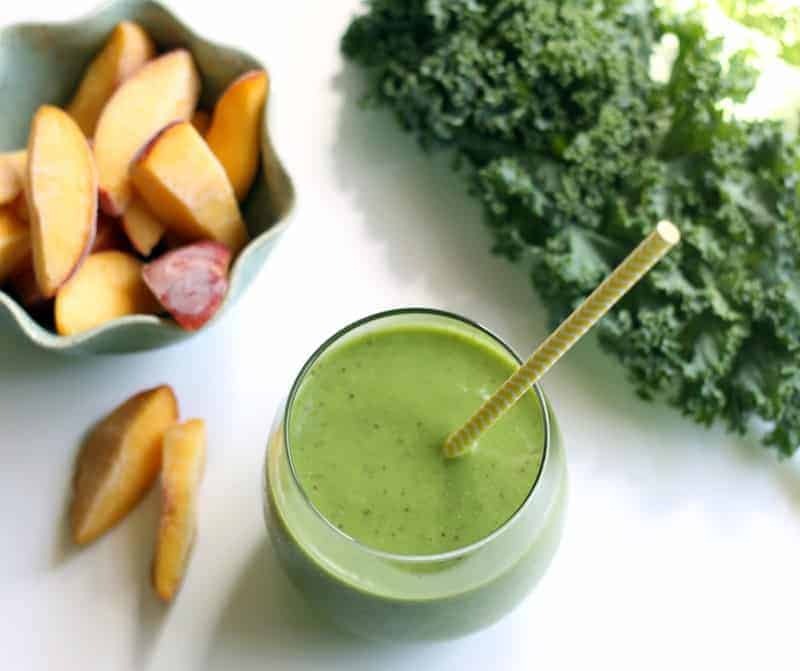 I’m adding kale to my grocery list, so I can try out this smoothie. I’m totally with you on eating veggies and fruit in the AM. It makes for a perfect start to the day AND a meal you can always depend on! Hope you love it doll! peaches are so trendy right now. oh and delicious. so the trendy thing to do is use them obvi. I have a peach recipe I have been wanting to test out… now would be the perf time I guess! Peaches are so IN. They’re the new apple. Loving the peach and coconut. I might have to swap kale for spinach, though. It’s just not really my thang! Right?! It adds the best sweetness for when I’m not in the nanner mood. I have an unhealthy straw obsession…I ADMIT IT!!! The cutest. I LOVE your style of writing, you are hilarious! :-) I always enjoy reading your posts. Growing up in Sri Lanka we used to drink coconut water right out of the coconut and the packaged stuff I have tasted here just doesn’t taste like the real deal -to me at least so I don’t really drink packaged coconut water. This smoothie sounds way refreshing indeed and kudos to you on getting your fill of veggies and fruits first thing in the am!! Okay I am beyond jealous. Can we hang out and drink water from all the coconuts?! I am so happy to have found your blog and now I cannot stop reading. 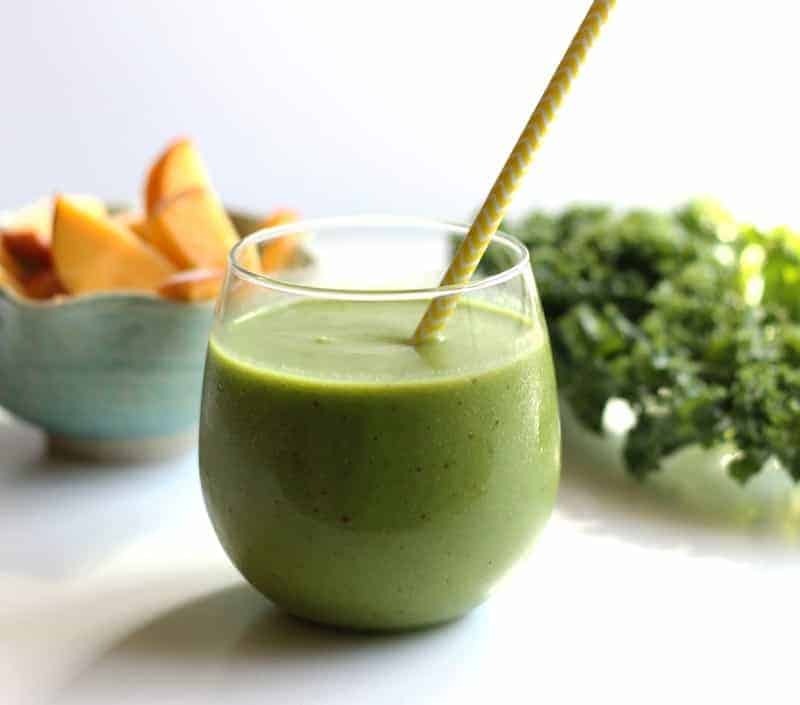 Thank goodness I found it before breakfast so this kale smoothie could make it’s debut in my kitchen! Awww thanks so much, Brooke! You’re too sweet. Best! Mmm looks delicious! SO TRUE about adding too much kale though. It’s a fine line, for sure. The FINEST of all the lines. Add a little ginger and you have my go-to smoothie. And you are soooo right about adding too much kale. Total mud. OMG Yum!!! I am totally adding ginger next time! Right?! I just add hemp for some protein, but it’s delish with or without! Finally, a kale smoothie without mango! Nothing against mango but…. I’m allergic. Can’t wait to give this a try! Thanks for sharing this yumminess! You’re so welcome!! Such a bummer that you’re allergic to mango :/ Mango-free smoothies it is! I’m not into these kind of food but its photos looks very delicious and healthy. Now I’m left with the urge to try this. Thanks for sharing!